I was sitting in the waiting room at my doctor’s office yesterday and she walked out of an exam room with another patient. They were talking about scheduling his next appointment and she mentioned that if he wanted, he could do it using telemedicine. Of course, my ears perked up, but he looked at her like she was from mars. He clearly had no idea what telemedicine was and seemed somewhat frightened and intimidated. They were quickly out of earshot, so I don’t know how well she was able to explain the idea to him or whether he’ll be doing his next visit via video. But the incident reminded me that providers who want to expand the use of telemedicine in their practices need to be very good at explaining the concept and benefits to patients. Here are some tips on how to talk about telemedicine with patients in plain English. 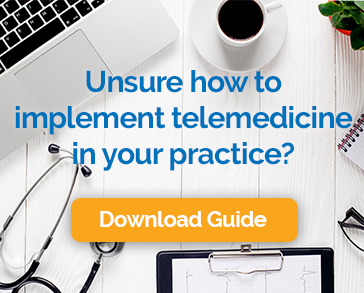 Start by explaining that telemedicine refers to the practice of using telecommunications technology to evaluate, diagnose and care for patients at a distance. There are lots of things that can be considered telemedicine including remote patient monitoring and sharing patient records over secure email connections, but what you are talking about is a visit that is done using video conferencing over the internet. The patient and healthcare provider communicate using an application designed for the purpose. The patient may participate using a personal computer with a webcam or smart mobile device with a built-in video camera. It is useful to talk a bit about how telemedicine is used. You might mention that telemedicine is appropriate for many primary care and follow-up visits. It is also a good way for patients to get specialty care and depending on the concern, it is a good alternative to urgent care clinics or emergency rooms for non-emergency situations. Take a minute to let your patients know what’s in it for them. Here are a few of the key benefits of seeing a provider remotely. No transportation time or costs – When you see your doctor on your mobile device or computer, you can save money on gas, parking, and public transportation. No need to take time off of work – You can schedule your appointment during a break, or before or after work. You can do the visit from anywhere that you feel offers you enough privacy. There’s no need to waste your precious paid time off. Eliminate child or elder care issues – If you have the responsibility for caring for children or older adults, finding someone to fill in can be a challenge, as can bringing them along. Telemedicine lets you see your doctor while managing your family responsibilities. Less exposure to illness – While we take great care to keep patients from passing illness to each other, the fact is that doctor’s offices are full of sick people. With a video visit, there’s no chance that you’ll catch something from another patient. Improved health outcomes – When you are able to see your us as often as you need to you put yourself on the path to better health. According to a recent survey by Medscape, an online medical news resource, which include 1423 healthcare providers, and 1103 patients to assess their attitudes toward telemedicine and other emerging technologies in healthcare, the number one concern of patients is whether the diagnosis will be accurate. To overcome this concern, begin by assuring the patient that you realize that not every medical situation is right for a video visit. Let them know that you and your staff know when it is safe and effective to conduct an encounter using telemedicine. Patients are right to be concerned about the privacy and security of their confidential medical information. While today’s digital world offers a lot of convenience, there are risks. Make sure they know that you’ll be using a telemedicine solution designed specifically to protect patient information and meet the strict standards of the Health Insurance Portability and Accountability Act, known as HIPAA for short. Of course, your patients are going to want to know if telemedicine is covered by insurance. If your state is one of the twenty-nine that require private payers to cover video visits on par with how they cover in-office ones, let your patient know. If not, assure them that your office will verify eligibility for telemedicine before the visit. If the visit is approved, it will not cost your patient anything more than an in-person visit would under their coverage. Trying out a new way to see your doctor can be a little scary. We’re talking about health after all. What could be more important than that? It’s worth taking the time to explain the details of telemedicine and answer any questions that your patients have. Once they get comfortable with the approach, they’ll enjoy all of the benefits and so will your practice.